This popular toy was accidentally discovered by engineer James Wright while working at General Electric during World War II. He was trying to find a substitute for natural rubber that was in short supply. Interestingly the patent for this item is still in dispute. What is the name of this toy? The question above (the answer is B, by the way) was one of those asked during a trivia contest on a local radio station twice a day every day from Monday, October 21, through Friday, October 25, to celebrate National Chemistry Week (NCW). Members of the Ottawa Township High School (OTHS) ChemClub wrote 12 multiple-choice trivia questions, and the morning show host, Jay LeSeure, picked which ones he would use each day. The contest was so popular that the station lifted their policy of only winning once every 30 days because there were so many callers each day. Contest prizes were copies of the ChemClub calendar, which has the OTHS club pictured on the cover, along with pictures from our outreach programs shown on the May and July pages; the current issue of ChemMatters; and a gift certificate for a local restaurant. A big thank you to Marta Gmurczyk at ACS for supplying the calendars and ChemMatters and Rick Koshko, the news director at WCMY 1430 AM. We did an additional activity during NCW, on Mole Day. 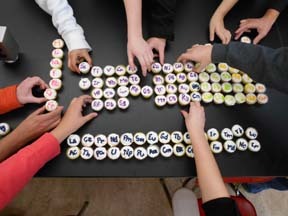 For our ChemClub meeting, two members made a periodic table of cupcakes 118 mini cupcakes, each decorated with the symbol of an element. They organized them into the periodic table before we safely consumed them. Please don’t try that with real elements! I even ate the plutonium myself, even though I was warned it smelled funny (Pu). In addition, we had molasses cookies and guacamole. We have had a very exciting start to the year and look forward to taking our show for elementary schools on the road during second semester. Recently we also received the Ambassador of Chemistry award from the ACS Office of Public Affairs for bringing chemistry to the public.